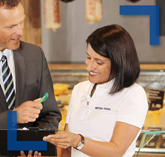 Perfectly placed to make your business more competitive with the best possible weighing, labeling, packaging and service solutions – that’s the vision of METTLER TOLEDO Retail as a partner for the grocery sector. METTLER TOLEDO Retail targets its core competencies on clearly defined areas. Within these zones, we actively seek the best combination of focused people, intuitive products and effective processes. Our focus is entirely on your business, your processes and your needs, which allows you to concentrate on what matters most to you: your customers. We join you in going the extra mile to achieve the very best results, always striving for continuous improvement. As a METTLER TOLEDO customer, you can rely on responsive and sophisticated service offerings that focus on reliability and maximized uptime and performance. Learn more about the expertise of our People. METTLER TOLEDO Retail’s weighing, labeling, packaging and service solutions are perfect for any environment. They provide a consistent and intuitive user experience – for your store employees, your customers, and your Operations and IT professionals. From the backroom and service counter, right up to corporate headquarters, all users benefit from METTLER TOLEDO’s high standards of quality and outstanding performance. Click here to explore our product portfolio. Customers in the spotlight – right from the very start. Our focus on customer processes through consultation and service solutions ensures that we meet our clients’ functionality and value expectations. Retail processes that are aligned with the markets, regions and sectors they serve. Processes which will change your business and enhance your customers’ experiences. Processes that reflect all of our know-how and expertise. Learn more about how we've developed Processes with our customers to enhance their businesses. Retailers who invest in weighing, labeling and packaging solutions from METTLER TOLEDO benefit from unique service and support – guaranteeing maximum productivity and long-term operability of their equipment and applications. Weighing systems require regular checks and maintenance to ensure they continue to perform accurately. That’s why the METTLER TOLEDO Service offering is designed to cover your solution’s entire life cycle, extending from installation and training, to maintenance and repairs, to customizable professional services. Our goal: maximize the efficiency and productivity of your operations. Click here to learn more about METTLER TOLEDO Service. Backroom efficiency paves the way for higher profits from your meat sales. Our weighing, wrapping and labeling solutions are designed to be robust and easy-to-clean, integrate with ERP systems, and support traceability and nutritional regulations. Our service counter solutions go beyond weighing and labeling, transforming the fresh department into the hub of your store’s operations. Counter scales enable integrated applications ranging from item management to shopper marketing capabilities. Self-service scales, with their applications for in-store advertising and information sharing, accelerate the checkout process and reduce shrink. We help create a unique shopping experience in your fresh produce department. Our weigh price labeling systems support high volume baked goods output for optimal presentation in product display cases. Robustness, precision and speed combine to simplify production and boost your bakery output. From checkout solutions that fully integrate with leading POS and scanner platforms, to basic check weighing applications, our checkout and self-checkout scales offer performance, speed and reliability. Our weighing and payment collection solutions offer the flexibility to extend your customers’ shopping experience beyond checkout. We offer portable compact scales with checkout functionality and open platform system to easily integrate with third party POS software. Learn more about specific areas of interest in food retailing.